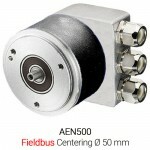 AEN500 Centering Ø 50 mm, Fieldbus Resolution 10-16 Bit Singleturn 12 Bit Multiturn Max. 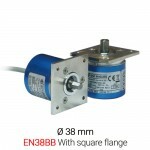 rotating speed momentary..
AEN536 Centering Ø 36 mm, Fieldbus Resolution 10-16 Bit Singleturn 12 Bit Multiturn Max. 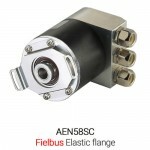 rotating speed..
AEN58SC Elastic flange, Fieldbus Resolution 10-16 Bit Singleturn 12 Bit Multiturn Max. 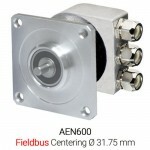 rotating speed ..
AEN600 Centering Ø 31.75 mm, Fieldbus Resolution 10-16 Bit Singleturn 12 Bit Multiturn Max. 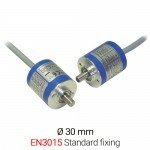 rotating speed moment..
▪ Compact-design incremental rotary encoder, based on optical principle.▪ Output by sealed cable in radial or axial position.▪ High accuracy and stability of signals.▪ Protected against inversion of p..
▪ Compact-design incremental rotary encoder, based on optical principle.▪ Output by sealed cable in radial or axial position.▪ High degree of robustness. 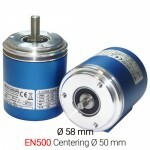 Aluminium flange and body.▪ High accuracy and ..
▪ Incremental rotary encoder, based on optical principle.▪ Small overall dimensions for applications with limited installation space.▪ Wide range of pulses per revolution up to 64,000 ppr.▪ Bidirectio..